In order to help establish his long-term legitimacy as leader of North Korea, Kim Jong-un has implemented numerous large-scale public works campaigns to raise living standards for targeted constituencies across the country. In Sinuiju, it's unclear how successful these projects will be in promoting the Kim regime. Despite the city's unique role in DPRK-China trade, its transportation infrastructure remains neglected, and North Korea's new merchant class is assuming greater influence over the local economy. Sinuiju City is the capital of North Phyongan Province. According to North Korea's 2008 census, its population was approximately 360,000, making it a mid-sized provincial-level city. Sinuiju rests at the end of the Yalu/Amnok River across from the Chinese City of Dandong, and due to its geographic location, it is a vitally important link in trade between the two countries. In the Text/Timeline/Graph features, we explore some of these economic and showcase political projects. Sinuiju is the home of North Korea's most utilized road and railway trade arteries, yet the city's transportation infrastructure has not been a high priority for government investment. The road from Sinuiju to Anju (half the distance to Pyongyang) is still an unpaved dirt road. Additionally, the World War II-era China-DPRK Friendship Bridge used to facilitate trade with China, North Korea's largest trading partner, consists of just a single traffic lane and railway crossing and it is frequently closed for maintenance. National and local leaders have on multiple occasions sought foreign investment to improve infrastructure in Sinuiju through the establishment of a Special Economic Zone (SEZ). However, there has been little real progress. China built a new four-lane suspension bridge to Sinuiju at a cost of nearly $350 million to serve as an alternate transportation corridor, but North Korea has not allowed the new bridge to become operational since being largely completed in 2014. A Chinese company has also constructed a tourist resort on the Yalu/Amnok river to serve Chinese tourists, however, its utilization appears to be far below capacity, and its impact on local infrastructure is negligible. (See exemplar image below). The Amnok River Tourist Area is the only noticeable economic project that has been completed in Sinuiju involving a foreign investor. Copyright 2018 Digital Globe. Despite the economic benefit that could accrue to North Korea from improved transportation and trade infrastructure in Sinuiju, construction in the Kim Jong-un era has been largely mobilized to carry out economic and entertainment projects aimed at showing "Kim Jong-un's love for the people"--in other words defining and securing the leadership of Kim Jong-un. 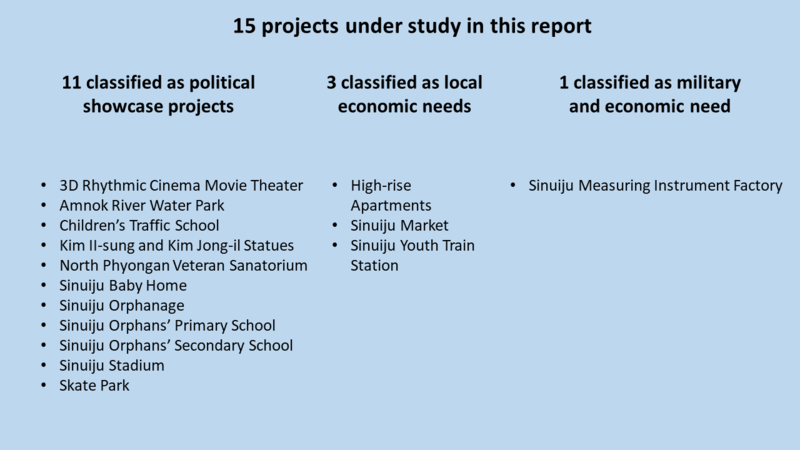 The kinds of projects being undertaken in Sinuiju, such as a new stadium, a new theater, school renovations, and new park construction are nearly identical to construction taking place in other provincial capitals, making it representative point of observation for signature projects of the Kim Jong-un era. However, it remains unclear just how popular and effective these centrally-driven projects are at meeting local demand for entertainment and generating political goodwill towards Pyongyang. (See exemplar image below). Bottom = skate park; right = 3D Rhythmic Cinema; top = traffic school. Copyright 2018 Digital Globe. Sinuiju's legal and illegal (but tolerated) market economies, however, have seen significant growth in the Kim Jong-un era. Most of the large legal markets have been expanded or renovated, offering newer facilities and more stalls for vendors. This is a win-win for North Korean consumers as well as local tax authorities. Additionally, North Korea's burgeoning real estate market, which appears to remain technically illegal, has been growing to meet the demand for new and higher quality housing by North Korea's burgeoning capitalists. (See exemplar images below). New market construction giving more space to vendors and presumably generating more local tax revenue. Copyright 2018 Digital Globe. These high-rises are perhaps the most significant economic development in the city. Copyright 2018 Digital Globe. Since coming to power, Kim Jong-un has promoted a propaganda campaign to secure the memories of his father and grandfather. Since coming to power, Kim Jong-un has promoted a propaganda campaign to secure the memories of his father and grandfather. In this picture we can see new Kim Il-sung and Kim Jong-il statues that were constructed in front of the provincial revolutionary museum, which was also renovated. These are very typical of the kind of propaganda construction projects that have taken place not just in Pyongyang, but at each of the provincial level cities. 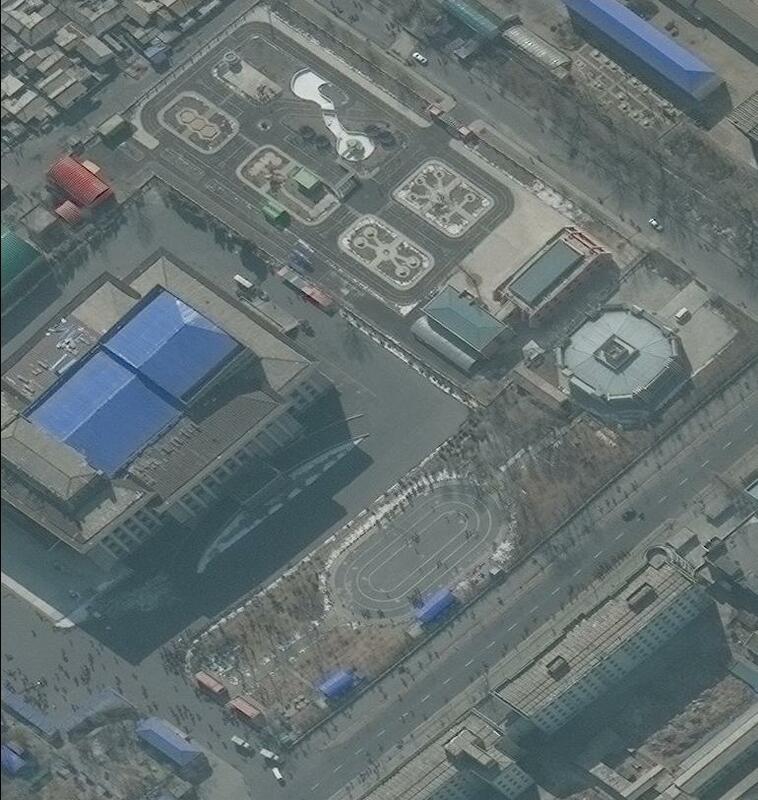 Today it appears that new Kim statues are being constructed in smaller cities and at corp-level military units. This picture also shows the completed renovation of the Sinuiju Youth Train Station. According to public satellite imagery, renovation work started in late 2011 and was completed by October 2016. The most significant change appears to be the addition of a covered platform at the main railway yard. On September 4, 2015, North Korean media reported that Kim Jong-un visited the Sinuiju Instrument Measuring Factory. On September 4, 2015, North Korean media reported that Kim Jong-un visited the Sinuiju Instrument Measuring Factory. 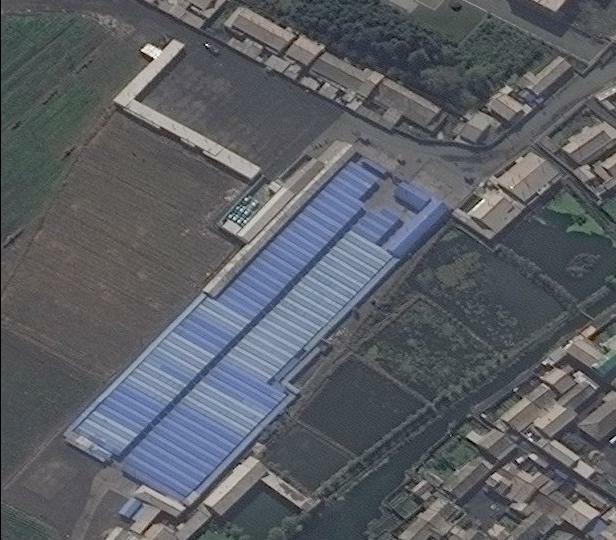 Although the name of the factory sounds unassuming, satellite imagery of the site reveals that it contains facilities for storing explosives, indicating a potential military purpose. Shortly after Kim Jong-un's visit, the factory began an extensive renovation that appears to be nearing completion. This pattern of activity, where Kim Jong-un visits a military factory and orders its renovation, has been seen in other plants as well including the January 18 General Machine Plant, Kangdong Precision Machine Plant, Sinhung Machine Factory, and the Tonghungsan Machine Plant. Skate parks, movie theaters, and traffic schools are typical service facilities being constructed nationally. At the bottom of the picture we can see a typical roller skating park. Parks like this are being built down to the town and worker's district level. Above the skate park we can see the octagonal "3D Rhythmic Cinema." Based on video footage in the official media, these are comparable to 4D cinemas, which incorporate 3D video with other physical effects to manipulate the senses. Satellite imagery indicates that these theaters are being constructed outside of Pyongyang in each provincial level city. Next to the cinema we can see the new Sinuiju Children's Traffic School. Based on a model school in Pyongyang, traffic schools are being constructed nationwide down to the local town level, even in remote areas where vehicular traffic, and traffic accidents, must be a rare occurrence. North Korea runs a segregated orphanage system where affected children reside and are educated in specialized nurseries and schools until they reach adulthood. 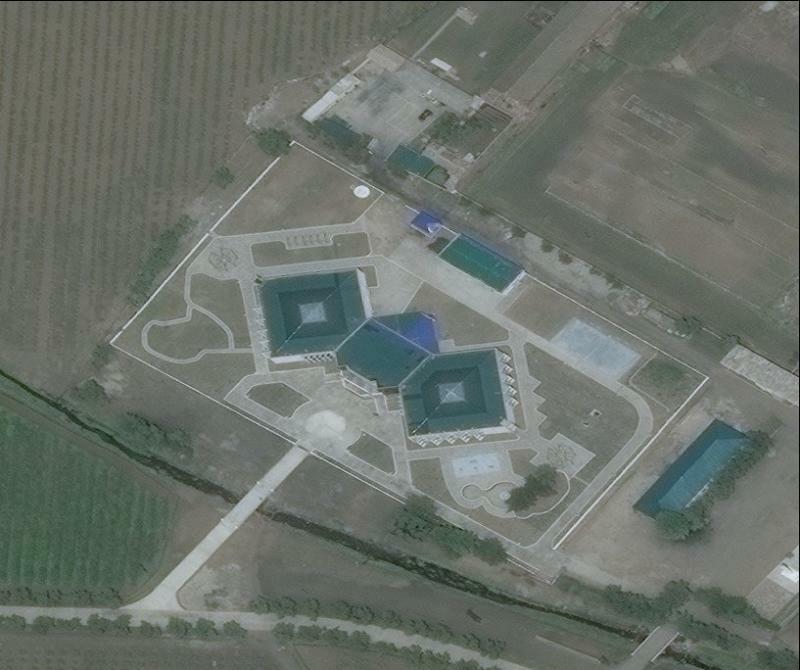 One of Kim Jong-un's signature public works campaigns has been the re-design and construction of new national orphanage facilities at the provincial level. According to the official media, these "cradles of love" contain amenities such as nursing and education rooms, intelligence toys rooms, dancing rooms, combined amusement rooms, indoor wading pools, combined physical exercise rooms and medical treatment rooms. The provincial level orphanages are based on model facilities first constructed in the city of Wonsan, Kangwon Province. 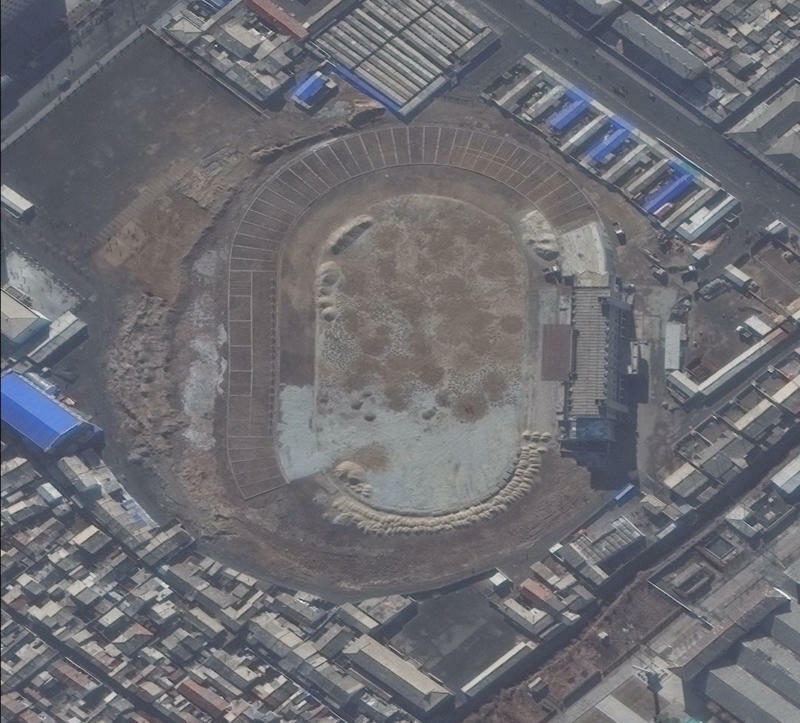 Sinuiju Stadium underwent renovations in November of 2016, but was largely completed by the end of 2017. Sinuiju Stadium underwent renovations in November of 2016, but was largely completed by the end of 2017. The original stadium was reportedly built in 1965 and seated 17,500 people. Efforts continue nationwide at both the provincial and county level to rebuild, renovate, and upgrade stadiums and gymnasiums. This policy is reflected in annual cabinet reports on the national budget as well where since 2012 North Korea has specifically reported spending increases on "sports." Starting in 2013, a number of high-rise apartments have been constructed in the central neighborhoods of Sinuiju around Chaeha-dong. These high-rises are perhaps the most significant economic development in the city. Reports from inside North Korea indicate that much of the construction and financing for these buildings is being managed by private actors in cooperation with state oversight who are responding to market demand for more/better housing in the city. Units in this complex reportedly cost between $20,000-$30,000. Development of this project indicates that the old socialist system of assigned housing continues to gradually give way to a de-facto private property market. 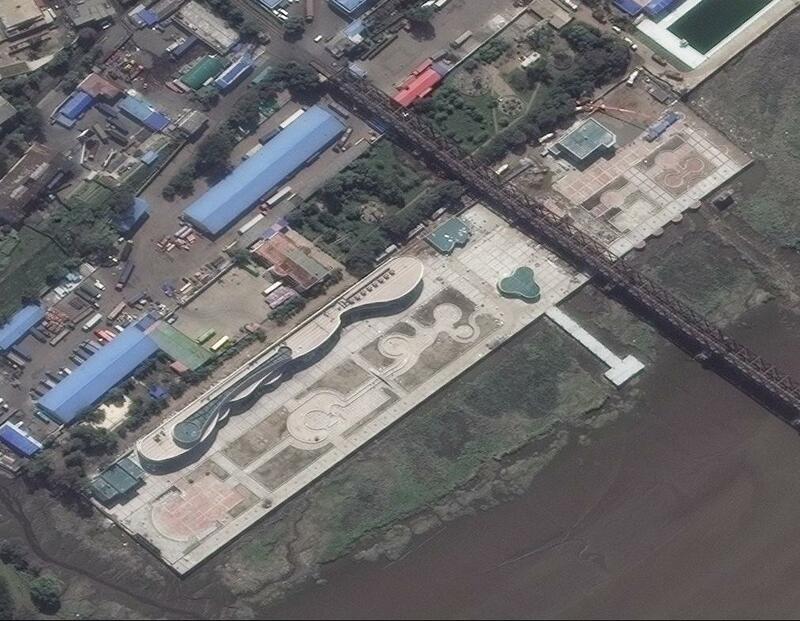 The Amnok River Waterpark was largely completed by August 30, 2013, when it was featured on state television. The Amnok River Waterpark was largely completed by August 30, 2013, when it was featured on state television. 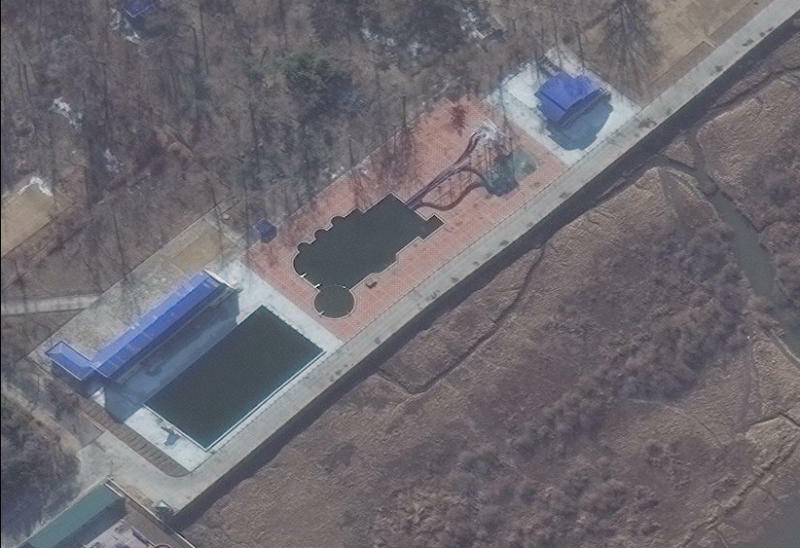 It features a 50m pool, two diving platforms, two water slides (possibly manufactured by the KPA's December 7 Factory), locker rooms, and restaurant. Similar water parks have been built and renovated in Haeju, Nampho, Phyongsong, Hamhung, Rason, and Kanggye. North Korea has also reportedly constructed a water park in the Kamchatka Territory of Russia. Sanatoriums for veterans of the Korean War have been built in most North Korean provinces. Sanatoriums for veterans of the Korean War have been built in most North Korean provinces. Each sanatorium, nearly identical in construction, reportedly has a total floor space of several thousand square meters, service facilities like physical therapy, gymnasiums, barber shops, fishing, and other activities. According to KCNA, "Unable to repress the excitement at the grateful benevolence of the Workers' Party of Korea, which is glorifying the lives of the war veterans, [veterans] are fully resolved to repay the benevolence by implanting the spirit of defending the leader unto death and the spirit of defending the country in the 1950s in the minds of the rising generation." In 2012, Sinuiju's centrally-located and largest market, the Chaeha-dong Market, was relocated to the outskirts of the city. 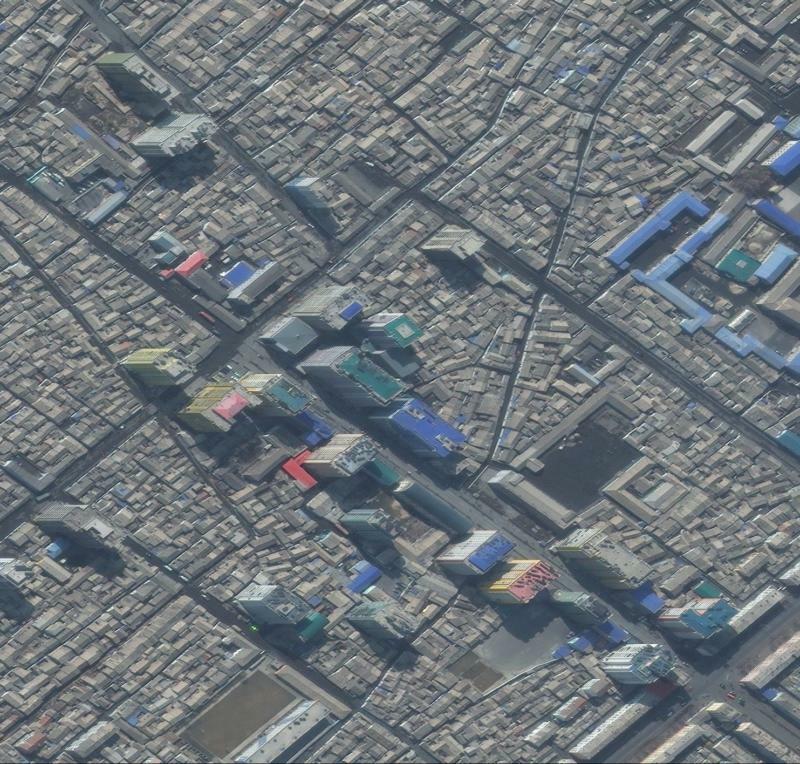 In 2012, Sinuiju's centrally-located and largest market, the Chaeha-dong Market, was relocated to the outskirts of the city. A new skate park was built on the site of the former market and that was partially demolished to build new high-rise apartments. The new market location is larger, giving more space to vendors and presumably generating more local tax revenue. Another improvement is the addition of a large parking lot, which will improve the availability of goods in the market. The experience of this market is very typical of markets in the Kim Jong-un era. Since the current leader assumed power, nearly two-dozen new markets have been constructed and hundreds have been renovated or expanded like this one. The Amnok River Tourist Area is the only noticeable economic project that has been completed in Sinuiju involving a foreign investor, the Dandong International Travel Agency. The Amnok River Tourist Area is the only noticeable economic project that has been completed in Sinuiju involving a foreign investor, the Dandong International Travel Agency. An opening ceremony for the facility was held on December 22, 2015, but with a capacity of 10,000 tourists at a time, it has been drastically under-utilized. The reported cost of the 130,000 sqm facility was 50 million yuan, which investors hoped to recoup with tour packages costing approximately 300 yuan. Amenities at the facility include duty free shopping, North Korean restaurants, a theater, and live artistic performances. It is unclear from open sources how popular the project is, but satellite imagery indicates minimal activity. To the extent that the US wishes to maintain an accurate assessment of the relationship between China and North Korea, experts should be familiar with exchanges between the two countries, especially trade and investment flows, or efforts to draw North Korea closer to China. In this regard, Sinuiju is perhaps the most important locality to keep tabs on owing to its importance in bilateral trade. From the standpoint of current policy, monitoring activity in Sinuiju is important from the prospective of enforcing US and UNSC sanctions. Areas of interest should include current and potential border crossing and shipping routes. Areas where North Korea has sought to attract foreign direct investment should also be monitored. 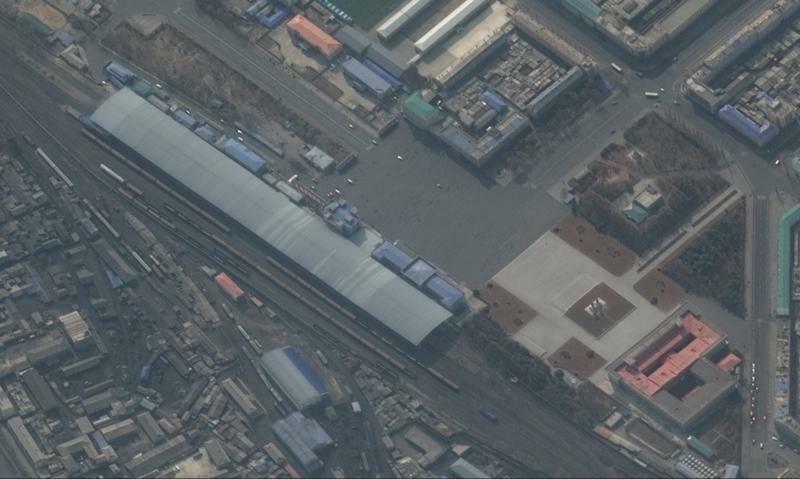 How busy are Sinuiju's ports and border crossings? 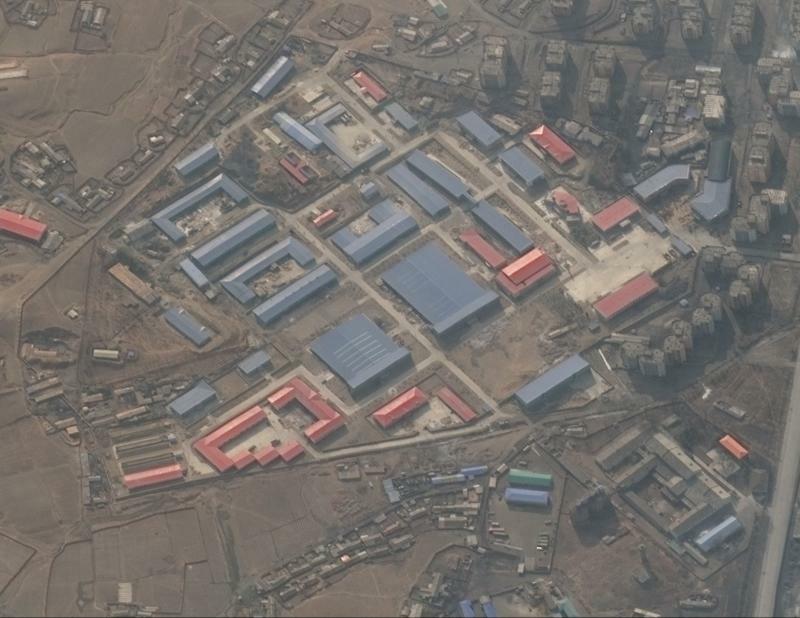 Are improvements underway at factories associated with significant military production? Is progress being made on opening the new Yalu/Amnok River Crossing? Is progress being made at any of the Special Economic Zone (SEZ) sites on the Yalu/Amnok River? Is there an upward trend in housing construction?